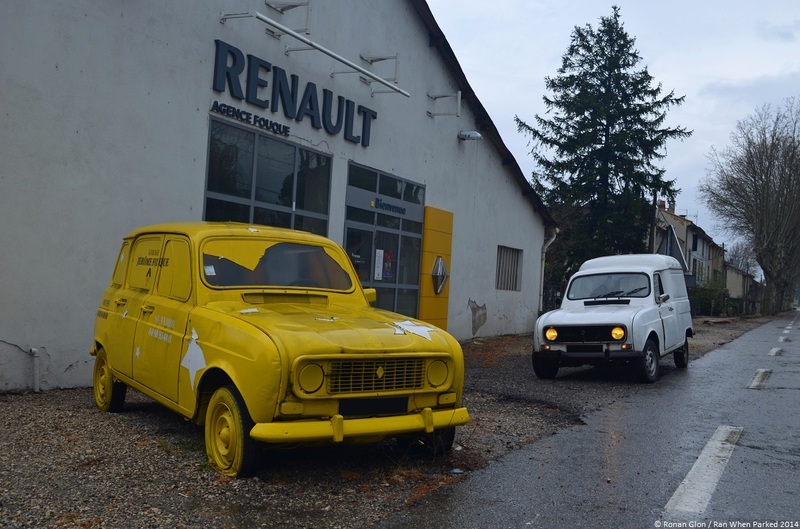 We have been driving past this Renault 4 for years but we only took the time to stop and photograph it a few weeks ago on our way back from the rainy Avignon show. Parked on the side of a busy road, the 4 is ending its days as an eye-catching billboard in front of a Renault dealership. Although the emblem on the trunk lid has been ripped off, there are several signs that make it clear we’re looking at a base-model 4 and not a GTL model. It is not fitted with an air vent below the grille, it doesn’t have plastic cladding on the bottom of the doors and it is not equipped with the two arched metal tubes that were designed to protect the front end from dings and dents. A closer look reveals the 4 was built in either 1982 or 1983 because it features the later-style dashboard with an instrument cluster similar to the one found in the 5 hatchback. The dashboard was introduced in time for the 1982 model year. Finally, the exhaust line goes down the left side of the car and exits right in front of the rear wheel. Starting in 1983, the 4 and the 4 TL were both fitted with a longer exhaust line that exited at the rear of the car. Regardless of when it was built, it’s admittedly kind of a shame to see this 4 rotting away in front of a dealership. Yellow paint aside, it is cleaner than some of the 4s we see driving around on a regular basis and less rusty than our own 4 F4 (visible in the background of some of the pictures). The odometer reads 220,000 kilometers (136,000 miles), which means it still had plenty of life left in it when it was taken off the road.